CHITTENDEN — On July 7, Khele Sparks, general manager of The Mountain Top Inn & Resort, announced the opening of the resort’s new 6,000-sq. ft. spa and salon, located on the newly renovated first floor of the resort’s event barn. It features sauna, massage therapy, body scrubs, facials, manicures, pedicures and professional hair services. “For quite some time now, our resort guests, including wedding parties, have been asking for a more complete menu of spa and salon services,” said Sparks. “When you think of a true destination resort, a day at the spa can be an integral part of that experience,” he continued. Spa managers, Rejuvenate LLC., have chosen products and raw materials to use in the spa based on their ability to source locally and naturally. The Mountain Top Inn & Resort contracted The McKernon Group headquartered in Brandon, Vt., with the build-out of the spa. 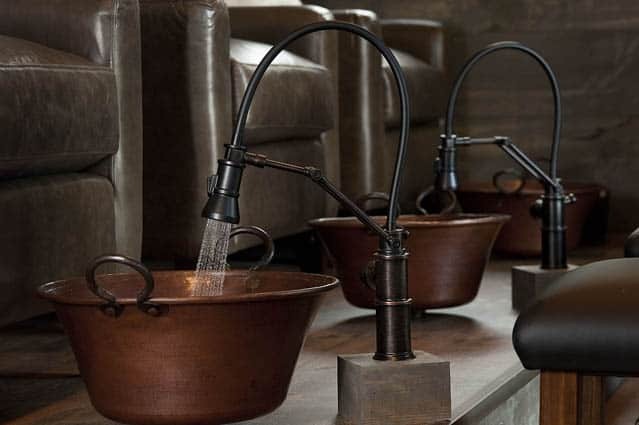 In keeping with the ‘rustic-luxe’-theme throughout the resort, the space features characteristics such as barn board sliding doors and wall paneling, slate flooring and shower tiling, custom-made Vermont soapstone sinks and hammered copper basins. Interior decoration was led by Jeanne Cole Design. The spa and salon is open to day guests as well as guests staying at the Mountain Top Inn & Resort. A full list of services can be found on the resort’s website. Mountain Top Inn & Resort is located in Chittenden, Vt., just 11 miles from Killington Mountain, making it a popular vacation destination. The resort sits amidst 350 acres of forest and meadow abutting the Green Mountain National Forest and resting at the tip of Chittenden Reservoir. The Inn offers a variety of classic and luxury accommodations in the main lodge, plus cabins and guest houses. For more information visit www.mountaintopinn.com.